Round 2 has now shifted to Vancouver Island and tonight the Vancouver Giants will look to take a 3-0 stranglehold on their series with the Victoria Royals. On Friday night the Giants earned a 3-0 victory on the strength of 15 saves from Trent Miner and some timely offense from Davis Koch, Jared Dmytriw and Dawson Holt. Then on Saturday Tristen Nielsen scored at 3:29 of overtime giving the Giants a 2-1 win and a 2-0 lead in the series. Mid-way through the third period of Game 3 the Victoria Royals struck for the first time in the series. Ralph Jarratt’s shot from the left-wing point deflected off of three different Giants on its way across the goal line, and ultimately helped the Royals force overtime. A few shifts later, Ralph Jarratt left Game 2 with an apparent upper-body injury. His status for Game 3 is unknown at this time. Royals goaltender Griffen Outhouse continues to give the Royals a chance to win thanks to his strong play. In Game 2 he stopped 37 of the Giants 39 shots after stopping making 25 saves on 27 saves fired his way in Game 1. The Royals are once again going to lean on Outhouse tonight at home who has stopped 86 of the 93 shots fired his way through three home games so far in the post-season. The WHL has handed defenceman Jake Kustra a two-game suspension following a five-minute major cross-checking penalty that he received in Game #1. Kustra had been suspended once prior this season. In six games in the playoffs, Kustra has notched one assist and 13 penalty minutes and an even plus-minus rating. 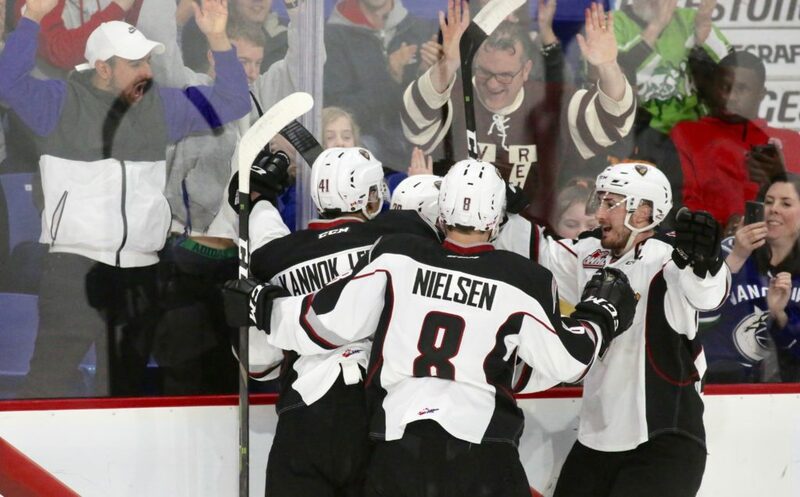 Tristen Nielsen is putting together quite a playoff for the Vancouver Giants. The 2000-born forward from Fort St. John now has three goals to go along with five assists for eight points. His third goal of the playoffs came at 3:29 of overtime lifting the Giants to a 2-1 win in Game 2. Nielsen is also a +7 and leads the Giants with 12 penalty minutes through eight playoff games. He’s provided a solid mix of grit, energy and timely scoring and once again the Giants will be looking to make a strong impact. Both Trent Miner and David Tendeck have appeared in four playoff games, and each goaltender is 3-1. Trent Miner started Game 1 and made 15 saves to earn the shutout victory and coming into tonight he leads all playoff goaltenders with a 1.51 goals-against-average, and a .938 save percentage. David Tendeck has a 2.48 goals-against-average and a .907 save percentage. Based on the trend of how things have gone so far, both goaltenders should expect to get a game over the course of the next three days. The Giants power play has scored in seven of the eight games so far in the playoffs. Davis Koch has recorded points in seven of the first eight playoff games. The Giants were 2-1-1-1 in Victoria during the regular season.